The Sicon Conveyor is a special enclosed continuous belt conveyor, designed to transport materials around sharp corners and to cover long distances without the need of additional transfer points. This allows easy route planning for new and existing plant layouts since the path can follow existing buildings. Additionally, angles with an incline of max. 30° can be achieved. 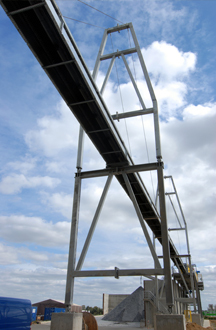 With this type of conveyor all pre-processed production wastes can be transported and mixed. These features make the Sicon Conveyor an economic all-rounder especially for complex routings and height differences. Multiple feeding points allow different materials to be mixed. This highly flexible conveying system can be easily implemented into existing plant layouts and buildings.